Colombia is an uproar over news that its national soccer coach, Hernán Darío Gómez, known as El Bolillo, punched a female fan in the face late on Saturday. 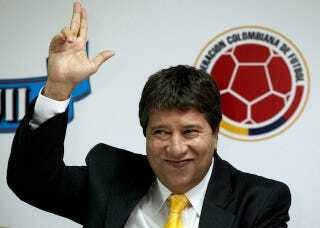 As of this morning, he has lost his position as Colombia's head coach for the next World Cup. No charges have been filed against Gómez (yet?) and the woman has not been named, but she has been described in various reports as being a drunk fan who insulted the coach. Subsequently, he punched her in the face at least four times, according to an eyewitness, who also said, "He hit her as if it were another man." Believe me, that this has made me very worried, and that I will take every and all measures necessary to make sure that this never happens again. As you know, I have always been in defense of women, whom I admire and respect. What I have done makes me ashamed because of my mother, my wife, and each and every one of the women in my family and in my country. Public opinion was divided on how much this should affect Gómez's career. At first, the president of the Commission for Gender Equality, Senator Alexandra Moreno, said there had been more repercussions when a player kicked and killed another team's mascot owl. By today, the repercussions were looking more serious, with the loss of the FIFA position and the announcement that the executive committee of the Colombian Soccer Federation was going to investigate whether he should lose further responsibilities.